Winner of the 1979 Oofuji Noburou Award. The Castle of Cagliostro is a masterpiece. 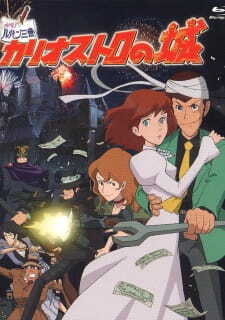 Lupin and Jigen are following the trail of some counterfeit money to a castle in a small independent country in Europe. This leads them to a girl from Lupin's past in need of a hero. Miyazaki's first feature film is a great one. He takes the already lovable Lupin cast and makes them just a bit more innocent, which gives this a very pleasant fairy tale feel. The characters are charming, and it's a joy watching the story unfold. In this great adventure, our heroes set out to save the damsel in a tower from an evil count. The always great Fujiko is there looking for some loot, samurai Goemon shows up to lend his blade, and Inspector Zenigata is on Lupin's tail as always. The movie has a laid back, cool feel at first. It also gets pretty fast paced, and the action heats up. Pretty much, it's great to see all the Lupin characters in top form, their interactions always entertaining. There are some nice nods for fans of the series too. For example, a montage of a younger Lupin's exploits features some of the situations from the intro of the original series. It's beautifully animated, with a very moving score by Yuji Ohno. And of course, great voice work from the Lupin cast. Plus this movie has one of the coolest car chases ever. Pretty much, this movie is two masters at the top of their game, Hayao Miyazaki and Lupin III. A true classic, check it out. When most think of revered anime director Hayao Miyazaki, they immediately think of seminal classics such as Spirited Away and Princess Mononoke. However, when I think of Miyazaki I think of a little film called The Castle of Cagliostro, which just so happens to be his directorial debut. To understand exactly what this film is, we have to travel back to 1971. Little known director Masaaki Ōsumi directed a show called Lupin III, an action/adventure/comedy series based upon the exploits of the eponymous master thief from the manga by Monkey Punch, which in turn was inspired by Maurice Leblanc’s crime novels about gentleman thief Arsène Lupin. The show proved to be too dark and adult-themed for general audiences, so Ōsumi was replaced by two directors. The new duo working under the name “A Productions Directors,” consisted of Isao Takahata (who would later give us emotional films like Grave of the Fireflies and Only Yesterday) and Hayao Miyazaki. Under their direction, the show was given a lighter, more family friendly tone, though this did little to affect the show’s already poor ratings. Following the show’s cancellation, Miyazaki and Takahata worked on various projects together. In 1979, the creators of the original Lupin III show, TMS Entertainment, ask Miyazaki to come back and direct the next feature film in the franchise. At this point, Lupin III has had one live-action movie (that borders on being absolutely terrible), one anime film (that’s in the same adult style as the original series), and a second anime TV show. With Miyazaki now in the director’s chair, one of the finest films ever created is made. The story starts off rather simply. Lupin III and his buddy Daisuke Jigen have just robbed millions of dollars off a high-class casino, making a clean getaway in their stylish Fiat 500. When they examine the money, the duo soon realizes it’s all counterfeit. Lupin instantly recognizes the high quality workmanship of the money. Years ago, he attempted to find the source of the “goat bills” himself, but was almost killed and narrowly escaped with his life. Now Lupin decides to locate the source once again at its supposed location: The Castle of Cagliostro. Before arriving, they rescue a young girl who was being pursued by a gang of thugs. She is later captured by the men, but not before leaving a ring bearing the crest of Cagliostro that gets into Lupin’s possession. The girl is revealed to be Princess Clarisse, who is to be married to the Count in a few days. By marrying Clarisse, the Count wishes to cement his own position of power by bringing the two families together and to uncover the fabled treasure of Cagliostro. Lupin bears a strange connection to Clarisse as old memories from his past soon come back to haunt him. No-nonsense samurai Goemon Ishikawa XIII joins the Lupin gang to help rescue the princess and Fujiko Mine assists by working under disguise at the castle. Kochi Zenigata also shows up in order to capture Lupin, but winds up helping him instead. Castle of Cagliostro is a real visual treat for the eyes. The gorgeous backgrounds are full of intricate detail and color. The character designs may seem simplistic, but I wouldn’t have it any other way. Lupin and his gang were meant to look this way. Not as realistic drawings, but as cartoonish and vibrant characters. Some people have claimed that this animation doesn’t look as good as Studio Ghibli’s films. I really think that’s an unfair comparison. Studio Ghibli’s artwork is more realistic, yet fantastical at the same time. With Cagliostro, the style is completely different. Lupin III has always been more about simplicity, and that’s not a bad thing. Characters are supposed to look basic, while backgrounds are meant to be more detailed. If this movie had animation like Princess Mononoke or Spirited Away, it simply would not work. Not only does this look amazing for 1979, it’s still breathtaking today. From that dreamlike opening titles sequence, to the masterfully animated car chase scene, to that climatic clock tower duel; Cagliostro simply looks beautiful. My review on the animation cannot do this film justice. It really has to be seen to be believed. The soundtrack is great too. Series veteran Yuji Ohno is at the reins here and his jazzy tunes perfectly fit each scene. The score can bold and upbeat for the more intense action scenes, as well as subtle and quieter for more mellow parts. The film’s main theme, “Treasure of the Flame,” is one of Ohno’s best contributions to the Lupin III music mythos with its beautiful lyrics and composition. I’m sure that most fans (myself included) will get a kick out of the use of the amazing Lupin III ’80 theme during the opening car chase theme. I also really enjoyed the use of the third movement from Bach’s BWV 590 organ piece during the wedding scene. It feels so haunting, yet strikingly beautiful at the same time. Altogether, Cagliostro looks and sounds wonderful. ‘Nuff said. As mentioned before, Hayao Miyazaki is director, and his fingerprints are all over this movie with its characters. You won’t find any of his environmental or political themes here, but his influence is still strongly felt. Lupin is noticeably much more “nicer” than previous incarnations and demonstrates his more chivalric side. Although he is very much after the treasure, he no doubt wants to save Clarisse by being, as he puts it: “your thief in the night.” Yasuo Yamada is back again as Lupin and he plays him expertly as always. In fact, all the Japanese regulars are here again. There’s really not too much else to say about the original Japanese audio, because it’s pretty much perfect. The actors hit all the right notes with each scene and character, so there are no problems here. Instead, I’ll talk more about the two English dubs. In the Streamline dub, Lupin is voiced by veteran voice actor Bob Bergen. I should also note that in this version, Lupin is referred to at all times as “The Wolf,” due to fears of copyright from Maurice Leblanc’s intellectual property estate. This is sort of laughable though, as the symbol on his belt clearly bears the letter “L,” and his calling card also reads the name “Lupin.” While I normally enjoy Bergen’s voice work, he sounds way too cartoonish and silly here. It’s not terrible or anything, just kind of unfitting for a master thief. David Hayter in the Manga dub, on the other hand, is far better suited for the role. You heard me right. The same guy who voices Solid Snake in the Metal Gear series voices our main protagonist. How cool is that? He perfectly gives Lupin that “nice guy” vibe and always nails each line of dialogue. There are hints of kindness in his voice, but also a bit of the gruff Snake tone when he gets more serious. With Zenigata, David Povall is serviceable in the Streamline dub, but Dougary Grant proves to be much more entertaining to watch in the Manga dub. It’s clear that Grant was trying to emulate Gorō Naya’s acting in the original Japanese dub, though he does a good job in the role himself nonetheless. This time around, Zenigata teams up with Lupin to uncover the secret behind Cagliostro’s counterfeiting ring. The banter between these two guys is pretty funny to watch seeing as how they’re normally enemies. Then we have our main villain, Count Cagliostro himself. There’s really not a lot to say about him, because there’s little character to him other than he’s the evil guy after the treasure and power. Even still, he provides an excellent foil to Lupin by being that diabolical antagonist to go against our hero’s noble and heroic antics. Both actors in the two dubs do a pretty good job of getting that “snobbish aristocrat” personality out of him and there’s not a whole lot of difference between their performances since they handle the character so similarly. The final sword fight between Cagliostro and Lupin in the clock tower is an absolute joy to watch; and it’s seems to have inspired several works of animation from The Great Mouse Detective to Batman the Animated Series. I should also note that voice actor Kirk Thornton actually appears in both dubs! In the Manga dub, he plays Count Cagliostro and in the Streamline dub he plays the chief guard Gustav (who in the Manga dub has an awful Arnold Schwarzenegger-like voice). We also have two female supporting characters. The first is Clarisse. With her voice, I have to say that I prefer Joan-Carol O'Connell’s acting in the Streamline dub than Bridget Hoffman in the Manga dub. Both actresses do a great job, but I feel that Hoffman sounds a bit too childish for my tastes. Clarisse seems to be little else other than the stereotypical damsel in distress. However, I don’t necessarily see this as a bad thing. That famous scene where Lupin climbs the tower to rescue Clarisse is an obvious homage to classic fairy tales. In fact, I think that in the Streamline dub this is more apparent when Lupin calls himself Clarisse’s “knight in shining armor.” Even though she may not be the strongest female character ever, you still want to see her rescued by Lupin. Again, it’s sort of the same with the Count. These characters aren’t meant to be complex, but rather basic archetypes that are supposed to be simple enough for the audience to sympathize with. Lupin is the brave hero, the Count is the evil villain, and Clarisse is the damsel in distress. With this kind of film, you don’t need any more depth or character beyond that. That’s not to say there’s not a strong female character in this film. Come on, it’s Miyazaki! He’s better than that! That role belongs to Fujiko Mine, Lupin’s lover, ally, and foe. In Cagliostro, Fujiko is no longer the buxom babe that she was in previous incarnations. Miyazaki never cared for Fujiko being the object of Lupin’s lustful desires and long-time fans of the franchise will immediately know what I’m talking about. This time around, she’s a spy working undercover at the Count’s castle. She helps Lupin out of sticky situations, but it’s clear she has her own intentions. Between Streamline’s Edie Mirman and Manga’s Dorothy Elias-Fahn, the point must go to the Manga dub. Elias-Fahn gives off much more emotion than Mirman, whom I consider to be a little too stiff in the role. Finally, we have our supporting characters Daisuke Jigen and Goemon Ishikawa XIII. In previous anime, Jigen and Goemon are Lupin’s loyal henchmen and that’s no different here. Jigen is Lupin’s straight man, and he always has Lupin’s back with his quick gun-slinging skills. I found Jigen’s Streamline voice actor, Steve Bulen, to be way better than Manga’s John Snyder by far. Bulen feels perfectly natural, but Snyder tries to add a sort of “toughness” that’s unconvincing. He’s still perfectly fine, but there is a notable difference between the two actors. Either way, both manage to have perfect chemistry together with Lupin’s actors Bob Bergen and David Hayter, respectively. Sword-wielding samurai Goemon has little dialogue in both versions. As an honorable warrior of little words, he’s the type of guy who doesn’t waste time talking and focuses solely on the matters at hand. Steve Kramer in the Streamline dub and Richard Epcar in the Manga dub give different takes of the character. Kramer is quiet and calm with his voice (though he does have quite a few annoying one-liners), while Epcar’s voice is deeper and has more presence. I don’t really think it matters that much if I compare the two together, since Goemon doesn’t have that big of a role in this film to begin with. Basically, the two actors play him fine. Speaking of Goemon, here’s a pretty cool Easter egg I discovered at the beginning of the film. Lupin and Jigen rob a casino in the intro, but throw the money away when they realize it’s fake. If one looks closely during the scene where Lupin tosses the bills out of the sunroof, the top of Goemon’s head and sword can be seen in the pile of money! I didn’t realize this until I read some trivia online. This is probably why Lupin and Jigen were able to make such a clean getaway and they probably dropped him off before they reached the Cagliostro border. I’m guessing that there was probably a planned sequence with Goemon, but it was taken out from the final film. Really though, Jigen and Goemon don’t serve that much of a major purpose in the film other than being Lupin’s backup. Still, I think that they’re both given enough screen-time as is. Giving Jigen and Goemon bigger roles would only shoehorn them into the plot. This film is really more about Lupin and his own quest to save Clarisse. Overall, both dubs have their own strengths and weaknesses. The Streamline dub takes some rather needless liberties from the original Japanese script and the lip movements don’t always match up with the dialogue; but the acting is solid for the most part. The Manga dub is much more faithful to the Japanese script and the acting is strong; but there is much more swearing in this version. I’m not offended by this or anything, but it kind of ruins what’s otherwise a family friendly film. Regardless of which dub you get, it shouldn’t really affect your overall viewing experience. I’m honestly a purist for the original Japanese language track with English subtitles, but I have to say that I prefer the Manga dub over the Streamline version. Since most releases usually have the Manga dub, that’s probably what you’re going to get anyways. The Streamline dub will probably appeal more to those nostalgic fans who had the film on VHS way back when it was originally released, but it really shouldn’t matter for the casual viewer. Now that I’ve talked about virtually every aspect of the film, I’m going to give my own personal take and thoughts on something that rarely gets talked about: the hidden level of emotion and storytelling that can easily be missed by the average viewer. I’m probably drifting into spoiler territory here, but chances are you’ve probably seen the film already. If you haven’t; skip this paragraph, watch the film, and then come back to it. Anyways, onto my analysis. When I first saw this film, I instantly knew it was a perfectly crafted animated feature. I really loved the film, but because it was my first time in the rich universe of Lupin III, a lot of things slipped under my radar. What do I mean by this? After I had seen the film, I soon went to the original green-jacket series. The Lupin I saw in that show was almost the polar opposite of the one I saw in Cagliostro. While in the film he was brave, heroic, and chivalric; our thief in the show was crude, mean, and arrogant. This was of course due to the way he was originally portrayed in the manga series by Monkey Punch. What could have possibly caused this drastic change in character? The touch of Hayao Miyazaki. When Miyazaki and Takahata first worked on the series, Lupin’s evolution began. The series started hinting at this, but by the time we’re in Cagliostro; the change is complete. The production-wise reason of this was that Miyazaki disliked the original character of Lupin and wanted him to be more likable and nicer. Story-wise though, we see something that perhaps was unintended. The opening of the film shows Lupin and Jigen on a more-or-less standard caper: stealing money. The robbery goes off without a hitch and it’s clear that Lupin has mastered the art of thieving at this point. When he sees the counterfeit bills, that’s when Lupin’s old memories resurface. The man thinks back to a time where he was young and just starting out. In fact, we are treated to a brief flashback sequence that shows actual scenes from the original series re-animated and integrated mid-way through the film. Lupin looks upon those days with regret and chides himself for being so arrogant. Perhaps this represents Miyazaki’s own views on his earlier animation career. Now that Lupin is more experienced, those rookie days are behind him. Lupin wants to save Clarisse for the reason that he himself might be saved. As mentioned before, Clarisse is the damsel in distress; but she means much more than that to Lupin. She’s his path to what could possibly be a normal life. A normal life away from the chase and the thrills of being a thief on the run from the law. He battles through Cagliostro’s forces with all his might and in the end; he’s successful in rescuing her. Lupin is then face with a personal choice: what do I do from here? He looks into Clarisse’s eyes and sees the innocence that he himself never had. Lupin doesn’t want Clarisse to have the same life by following him. Instead, he leaves her behind but vows to always be at her side if needed. That final scene in which Zenigata is in hot pursuit of Lupin symbolizes how his thieving ways will never change. Lupin will never have a normal life because he doesn’t need one. He lives and enjoys his life by always being on the move and savoring every moment of the chase. Going back to Miyazaki, I think this also shows his own personal choice by being an animator. He enjoys what he does, and wants to create these kinds of films for the rest of his life. Just as Lupin’s purpose in life is to steal, Miyazaki’s is to create animated films. And that’s what I believe is the main theme in Cagliostro. Looking upon your own life and questioning if this is what you’re happy with. Can people really change, or do we stay the same throughout our lives? I find it quite ironic that such a seemingly simple film has these kinds of themes. Whether or not Miyazaki actually intended for this film to have a deeper meaning is up for debate, but I think that’s the whole beauty of it all. It doesn’t really matter if the creator intended for this film to have any symbolism or meaning. That’s up for the audience to decide. Cagliostro isn’t just an entertaining film, but a film that can actually teach you something if you look hard enough. Miyazaki does this in all of his films, but in Cagliostro it’s just less apparent. Now the difference between the film and the television show is probably quite obvious. Films have longer running times, thus more character development and plot can be added in. You can add drama and the previous themes that I mentioned, but not so much in a television show episode. Since Lupin episodes only are about 20 minutes, it usually just cuts right to the action. It’s a nice change of pace to see Lupin given more character and emotion than his usual TV self. Needless to say, I realized none of this when watching the film for the first time. However, going into this film with a new set of eyes made it mean a whole lot more to me. Now we come to the bad news. In the US, there’s unfortunately no definitive release of this wonderful film. Manga’s original DVD release of the film is a non-anamorphic transfer that only has decent picture quality. The DVD itself doesn’t even have any extras. A few years later, Manga released a “Special Edition” that improves picture quality and they even added a couple of extras. However, one absolutely pointless change completely ruins this release. The original opening titles sequence has been altered. Instead of using that beautiful animation with the Japanese credits, Manga decided to remove all Japanese text and only show still frames of the intro. Why would they ever do such a thing? It completely takes you out of the moment and destroys the original version! That’s why I cannot recommend you purchase this so called “Special Edition.” Both DVDs have also been long out of print for years. In Japan, Cagliostro received a deluxe Blu-ray treatment with a gorgeous new transfer in crystal clear 1080p high definition. Seeing has how it’s region free, I would have imported this in a heartbeat; but there are no English subtitles or language options. Europe received a full English version of this Blu-ray, but it’s region-locked; thus it can’t be imported by anyone else. I really hope that this release will come stateside soon. And why shouldn’t it? This is a classic work of Japanese animation! To all those that live in Japan and Europe, I urge you to buy this! Hopefully the strong sales of it will guarantee a wider release! Hayao Miyazaki’s last involvement with the Lupin III franchise was directing final two episodes of the second TV series. Miyazaki himself really doesn’t consider the film his best work, and called it a “clearance sale on all the previous Lupin ideas I had previously done.” If one watches the original television series, the influences that it had on this film will be extremely noticeable. There are many scenes here that are almost taken shot-for-shot from the series and a lot of the scenarios are similar. And perhaps that’s what makes this film so enjoyable. It takes everything that that Miyazaki ever did with the Lupin III series and puts it together into one satisfying experience. I don’t think that Miyazaki is ever going to go back to Lupin. Now that he’s with Studio Ghibli, there’s little reason for him to go back to the franchise. My one dream is for there to be a brand new Lupin III animated feature film that reaches audiences worldwide. It would give our thief the international popularity he deserves, similar to how Spielberg’s Tintin film revived interest in Hergé’s original comic series. Even if that never happens, at least we still have this masterful film that has aged remarkably well. This is a movie that, after you’re done watching, you immediately get a good feeling inside. Anyone who’s a fan of Hayao Miyazaki should see this film as it demonstrates his own animation techniques just when he was starting out. If you’re a serious fan of animation or film, you owe it to yourself to see the Castle of Cagliostro. It gets my highest praise and reminds us all why we enjoy the genre in the first place. Go see it! The Castle of Cagliostro is a gem, directed by none other than Hayao Miyazaki himself. For those of you who have seen some of his other works like Castle in the Sky or Princess Mononoke this should come as no surprise, despite it being his first film. The art style may seem a bit dated to some, but despite its age, it really gives the film life and is a treat for the eyes. In terms of audio, the dub and sub are both very nice, especially the dub. Coming from a person who cannot stand anything in dubbed, I have to say that their English voice actors, really fit their characters roles and as such made it easier to enjoy the film, so for those of you who prefer English over sub, you are in for a treat. The characters in general, ranging from Lupin all the way to the zany inspector Zenigata, were well written and interesting, with their various personalities, actions, and dialogue. It never felt stale, they really kept the picture alive. To be entirely honest, if you are a lover of Hayao Miyazakis work, or perhaps a lover of things involving Lupin and his pals, then I can guarantee that you will love this film, because it is quite honestly a classic. The Castle of Cagliostro is a really great movie. It's obviously quite old, seeing as how the animation can be choppy at times, but the characters are great and the story is wonderful. The storyline of this movie is well-developed and fast-paced. Unlike some Miyazaki movies, the Castle of Cagliostro has a fast-paced storyline that is very easy to understand. buildings, however, are very beautiful and realistic, and the characters look a little like cartoons. The music in the movie was pretty good and enjoyable. When there was music (which there often was) it fit very well to the current situation or setting. The characters begin well-developed and stay that way. I really wish that the character's could've developed a bit more throughout the movie because their personality was the same at the end as it was in the beginning. The main character is Lupin, a skilled theif who is also very relaxed and tends to joke around. There's also Lupin's assistant gunman, Jigen, who often questions Lupin but always ends up doing what he says. There's also Clarice, the &quot;damsel in distress&quot;, the GroundsKeeper of the castle and his dog Carl, and the Count, a twisted, evil, and double-crossing man. I really enjoyed this movie because of it's characters and storyline. The music was a nice touch as well. But if you're looking for a movie based on the art, you should probably pick another Miyazaki movie as this movie is not his best. Can I watch this movie even I know nothing about the series?